Celebrate her milestone birthday with a glittering sweet 16 party favor for your event tables! 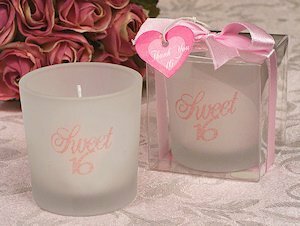 Each frosted glass votive holder features the words "Sweet 16" in pink glitter, and comes with a white votive candle. Favors measure 2" tall and are presented in a showcase gift box with pink ribbon and heart-shaped "Thank You" tag. I'm sorry, that item does not offer any personalization options. If you'd like, you can find our personalized tags & stickers that are sold separately by clicking here.